Check the DSSSB JE Recruitment 2019 for 264 AE, JE (Electrical, Civil) which are offered by the official’s of Delhi Subordinate Services Selection Board (DSSSB) through delhi.gov.in recruitment page. Aspirants can refer here for the DSSSB JE Apply Online starting and ending dates 30th Jan 2019 and 01st March 2019. Applicants can check the details and then start applying for this DSSSB AE Recruitment. Aspirants can get the DSSSB Junior Engineer Notification and then check the required details about the eligibility details like educational qualifications, age limit, application fee and selection process for this DSSSB Assistant Engineer Recruitment is mentioned below for the candidates. Contenders can check the details and then apply for this DSSSB Engineer (Civil, Electrical) Recruitment without delay. The officials decided to recruit the candidates for this 264 posts that is the reason they can pass the DSSSB Junior Engineer Notification on their official site for the candidate. Applicable candidates can get the exact details about the recruitment then only you can apply for this Junior Engineer and Assistant Engineer posts without delay. That is the reason we can mention all the details about the DSSSB Junior Engineer Vacancy also for the candidates knowing is the reason based on that vacancy you have an idea at the time fo filling the DSSSB JE Application Form. So, all the interested candidates and excited candidates can go through RecruitmentIndia.in site and apply for this DSSSB JE Recruitment 2019. 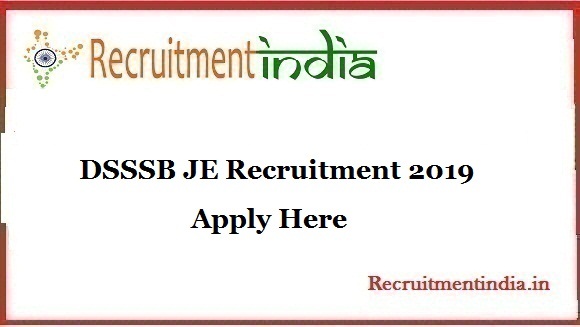 Applicants can read this post completely and then gather the DSSSB JE Recruitment 2019 details from this post and then ready to apply for this Junior Engineer and Assistant Engineer posts. Some of the candidates don’t know how to apply for this DSSSB Junior Engineer Vacancy for those candidates we can upload the detailed info for the eligible candidates like eligibility details and also DSSSB JE Application Form downloading links for the application purpose. Here you can also get the application process for this DSSSB Junior Engineer Notification and start applying for DSSSB Jr Engineer Recruitment after that download the admit card also. Here we can also mention the post wise age limit in this post for the interested candidates. Candidates can check the category wise application fee details in this post. Candidates can check the official notification for the salary details. The category wise vacancy details are mentioned in this post. Most of the applicants are searching for the DSSSB JE Application Form download links on other sites and wasting their valuable time for those candidates we can provide the important details about the post wise DSSSB Junior Engineer Vacancy details also. By seeing that you have an idea about the recruitment so all the candidates must and should download the DSSSB AE Notification and check the education qualification details. TRhe education qualification is different for these Junior Engineer and Assistant Engineer posts. So, candidates after checking the details you can also download the syllabus to prepare for the exam. If you have any doubt about the DSSSB JE Recruitment 2019 refer to this post. Candidates are you searching for the DSSSB Junior Engineer Vacancy details then you can do the important thing is to go through our site and then gather the details whatever you want regarding the DSSSB AE Notification. Some of the candidates are willing to fill the DSSSB JE Application Form those candidates don’t bother here we can provide the detailed info regarding the eligible details for the candidates knowing is the main reason. In that, we can provide the selection process also the officials decide to conduct the written test and interview for the candidates that’s why we can upload the previous papers for the candidates who can apply for this DSSSB JE Recruitment 2019.
i have done b.tech in civil. Can i apply for NDMC – JE post 2019 ?